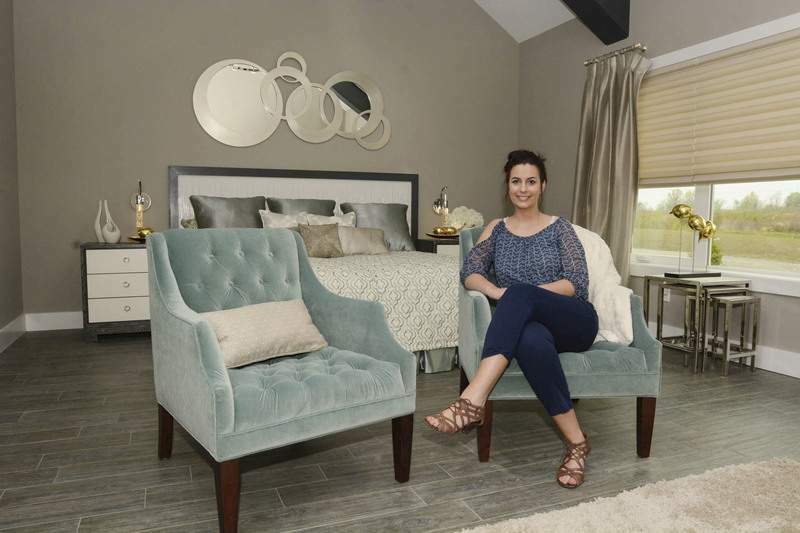 Photos by Michelle Davies | The Journal Gazette Allison Brackmann, an interior designer for CDI Choice Designs Inc., helped style the CDI Innovation home on Flutter Road. “Shades of blue have definitely been in style lately,” she says. 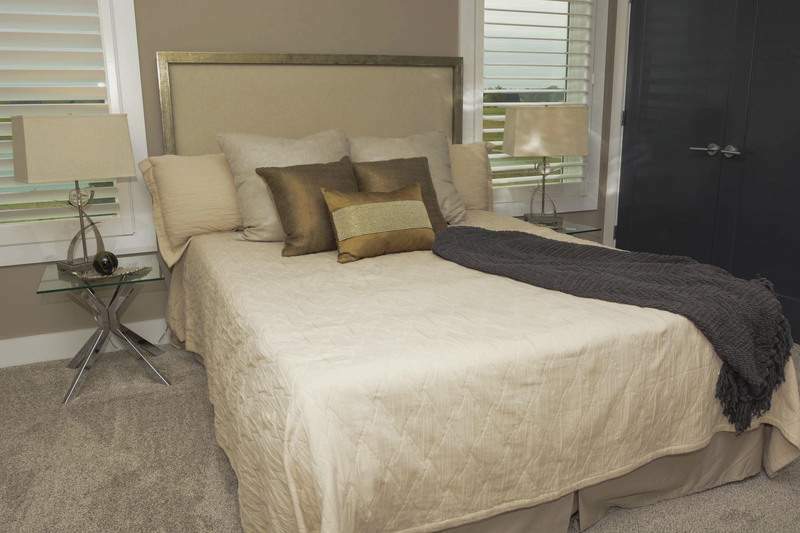 A bedroom in the CDI Innovation home features gold tones and varying textures. Designers are drawing from daydreams of simpler times, says Leatrice Eiseman, Pantone executive director. 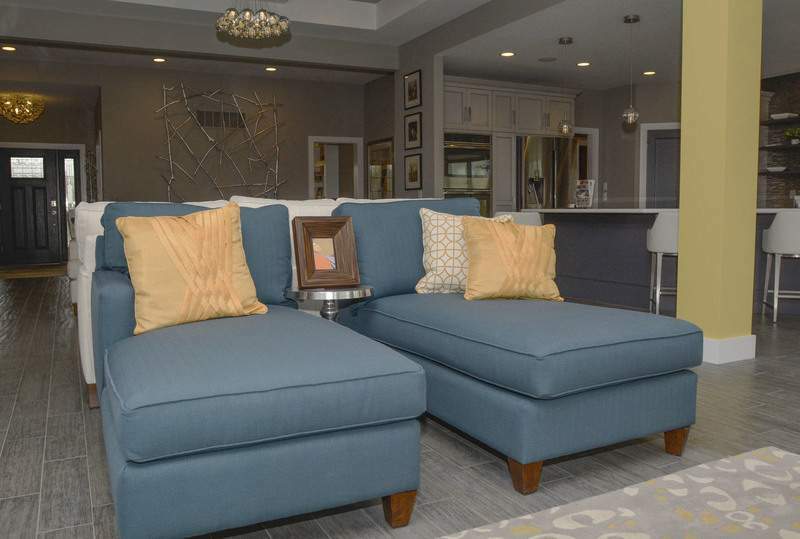 Michelle Davies | The Journal Gazette The living room of the CDI Innovation home features blues, earth themes and lots of different textures. That is so passe; so yesterday. While that might be a catchy title for a book and movie, it is hardly the recommended interior color scheme for a home in 2015. Ask around, and designers are saying that blue is in. 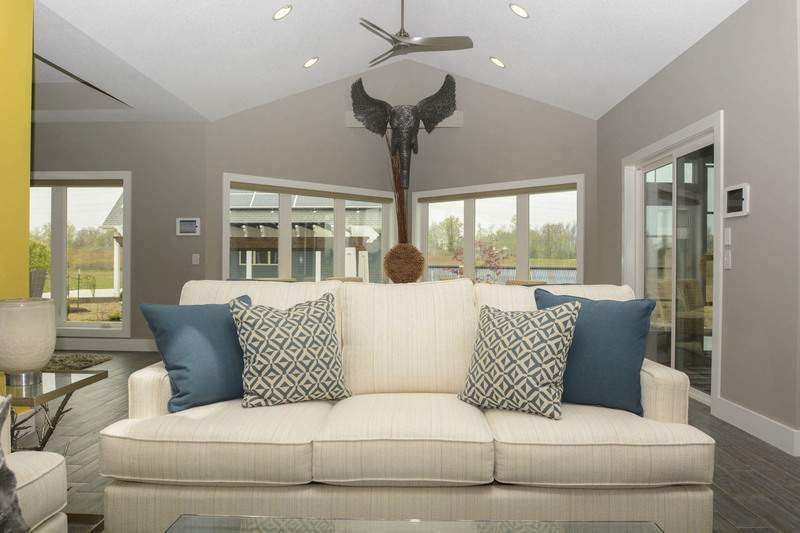 "I’ve seen blue in every room," says Sue Hoaglund of Decorating Den Interiors. "Bedrooms, bathrooms, living rooms, family rooms. Even in kitchens, when it comes to accessories; maybe bowls, dishes. It’s amazing how blue has come back again." Every year, fashion veers down a new avenue with its changing shapes and fabrics and even colors. Interior design, pardon the phrase, follows suit. "Pantone (fashion color report) comes out with a color of the year that is based through fashion trends of that year," says Allison Brackmann with CDI Choice Designs Inc. "Basically, it starts with fashion, and then it works its way down the line. "When you’re reading a magazine, you’ll see trends coming up for the year. It’s in your jewelry, it’s in your clothing, it’s in your accessories – shoes and pillows. It gets into weddings and bridesmaid dresses and pillows and rugs. It kind of works its way down until next year. Then they come up with another color scheme." Brackmann says aqua, teal and cobalt blue are becoming more popular throughout the interior design industry. "Shades of blue have definitely been in style lately," she says. Leatrice Eiseman, Pantone executive director, adds on the company’s website: "This season there is a move toward the cooler and softer side of the color spectrum. An eclectic, ethereal mix of understated brights, pale pastels and nature-like neutrals take center stage as designers draw from daydreams of simpler times." And just one blue won’t do. "So many of the blues were used in the same room," Hoaglund says. "You could go into a room setting, and the room would be filled with different tones of blue." While a "cool" blue is the hot color for now, some changes over the past few years have had a lasting effect. Take carpeting, for instance. And that’s what designers are suggesting – take out the carpet. "People are putting in hardwood floors and putting tile throughout their whole home," Brackmann says. "I would say some people still like to put the carpet in the bedroom for Indiana purposes. You don’t want to get up on the cold floors, but some are putting down area rugs around their bed." Several of these changes are from the 30- to 40-year-old set, Brackmann points out. Many of her older clients have their homes decorated the way they’ve always wanted them and aren’t going to change, or they’re saying goodbye to home maintenance and moving out altogether and into villas. Then there are some younger couples who are just beginning and can’t afford to make drastic changes. Those ready for change "want to move into some of these newer homes, and now they have the money," Brackmann says. "They are not quite 50, but they want to update their homes." Then there is the texture within the rooms. Lots and lots of it, from the fabrics on the chairs and sofas to even the walls resplendent with texture. "Wallpaper," Hoaglund says, "has made a comeback. And it’s not your grandma’s wallpaper." No flowery designs or stripes. Textured wallpaper, particularly grass cloth, is finding its way into newer homes. "They’re using it in powder rooms, bedrooms, hallways – even the back of bookcases and rec rooms and kitchens," Hoaglund says. "And there are lots of wallpapers that have shimmery details that adds a romantic touch to a room. It’s good for the bedroom." Adds Brackmann: "People have been inside all winter long and they’re ready for some change – ready for some color."